Lazarina Todorova is a documentary filmmaker and media artist originally from Bulgaria. Her work spans three continents spurred by a passion for media as a catalyst for equitable social transformation, ecological awareness and Earth stewardship. For over 15 years, she has focused on issues such as health and environmental sustainability, human rights, education and gender equity in collaboration with organizations in the NGO sector and through community initiatives. 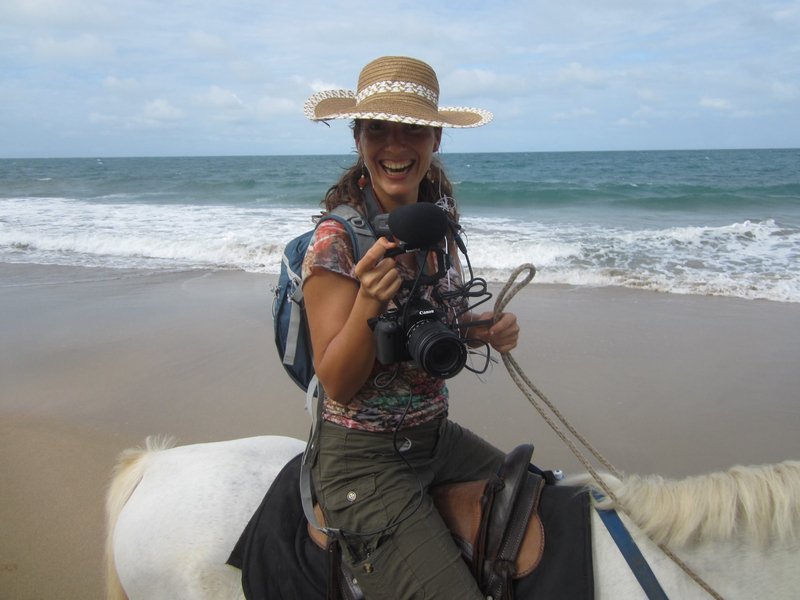 She has extensive experience filming internationally, including in conflict zones, as well as in challenging climates and locales, such as the Costa Rican jungle. BC Council for International Cooperation (BCCIC), Vancouver, BC, 09/2010 – 02/2011; Documented BCCIC events and workshops in poverty reduction and social justice for online dissemination. GoBEYOND Climate Action Network, Vancouver, BC, 09/03/2010 – 12/01/2010 ; Produced three shorts on climate change and sustainability issues to further mobilization and recruitment efforts. Supported by UBC Sustainability Office, Common Energy, and the Sierra Youth Coalition. Youth Initiative Canada, Vancouver, BC, 10/15/2010 -10/30/2010; Completed a fundraising video in support of YIC’s HIV/AIDS awareness program component. Amnesty International/ Oxfam Canada/ BCCIC, Vancouver, BC, 09/18/2010 Documented flash mob awareness-raising event as part of the Make Poverty History campaign. Yaletown Holistics, Vancouver, BC, 07/15/2010 – 08/31/2010; Created promotional video clips on alternative medicine treatment modalities. Sustainable Harvest International (SHI), 02/2010 – 06/2010; Created series of short video success stories showcasing SHI’s efforts in reforestation and sustainable farming practices with communities in northern Honduras. Panama, June 2008: Recorded teacher training workshops in child labor awareness, math and language arts. Deliverable: training DVD distributed to Panamanian Ministry of Education and client, U.S. Dept. of Labor. Funded by: U.S. Dept. of Labor. Afghanistan, December 2006: Covered community-based education efforts in Kabul and Parwan provinces. Deliverable: video success stories disseminated to client and stakeholders. Funded by the U.S. Agency for International Development. Jubilee USA, Washington, DC, 09/2007 – 10/2008; Produced an educational DVD on international debt cancellation, vulture funds and IFIs, used in the Stand Up campaign on Oct.17, 2008. Completed a series of mobilization pieces in support of the Cancel Debt Fast Campaign. Followed grassroots advocacy efforts on Capitol Hill and posted daily video dispatches on YouTube. Mental Disability Rights International (MDRI), Washington, DC, 07/2005 – 11/2007; Compiled a video reel for Serbian and international media in support of MDRI’s investigation and report titled “Torment not Treatment: Serbia’s Segregation and Abuse of Children and Adults with Disabilities.” Produced “Behind Closed Doors”, a video press release, which investigates the human rights of people with mental disabilities in Turkey. The Advocacy Project, Washington, DC, 10/2006 – 12/2006; Completed a 10-minute fundraiser for BOSFAM, a Bosnian organization assisting women survivors of the Srebrenica massacre. Rensselaer Polytechnic Institute, Troy, NY, 08/2000 – 05/2003; Teaching Assistant: Instructor in Video/Audio Production and Digital Imaging, core foundational media studio courses in the undergraduate Electronic Arts curriculum. The ARK, Troy, NY, Summer 2002 and Fall 2002; Community Media Instructor: Tutor in animation and video production for the ARK, an after-school program and community learning center situated in the Taylor apartments – a federally funded housing project.